Did pretty good at Superstore tonight – kinda sorta starting to see the appeal of Superstore to so many people. I might have to go a few more times this week and see if they add anything else! They had two bins with some stuff for 50 cents, I found a few things that appealed to me. I am not totally sure how much I saved, but after Googling and doing some rough math it looks like I saved approximately $50-$60. Looks like some of the stuff isn`t made anymore but the sunscreen alone used to go for around $18 a bottle. Part of me thinks I should of got another bottle of two of sunscreen but the sane part of me says I won`t use more than two bottles before they expire anyway – they have a good date, but we really don`t use much sunscreen. I also scored a two pack of king size pillows at HomeSense for $13 before tax – they look pretty nice and you can`t beat the price. It`s hard enough to find a single decent king size pillow for $13 – looking forward to trying them out tonight! Was super excited when I found them as I have been looking for pillows without spending a lot. 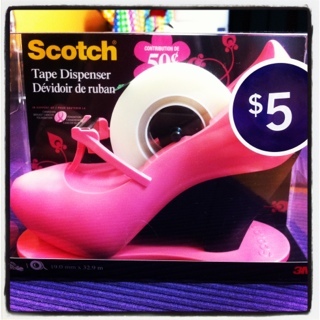 I also found this cute Scotch PINK high heel tape dispenser! Thought it might come in handy as I had to tape mine together while wrapping Christmas presents this past Christmas. 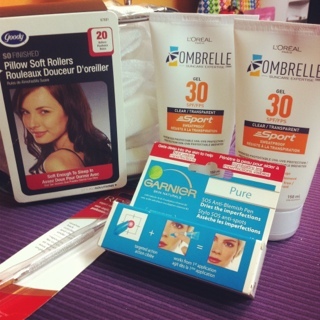 This entry was posted in deals, superstore and tagged deals, superstore on January 9, 2012 by Courtnie. Picked these up at Superstore last night. I have a few body washes already so I didn’t really need more but thought I would pick up two to give them a try. I figure there will be cheap body wash again, no need to get carried away. There is also a manufacturer coupon available at Shoppers Drug Mart. Some Superstores will allow you to stack the two together but ours doesn’t so I didn’t even try. 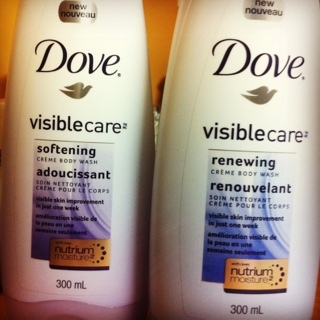 Walmart also has the Dove Visiblecare Body Wash on for $2.97 and you could use the coupon from SDM. But, the benefit of buying at Superstore, with a coupon zone coupon, is that you only pay tax on $0.97 and not $2.97 like you would at Walmart. This entry was posted in canadian coupons, coupons, superstore and tagged canadian coupons, coupons, superstore on January 9, 2012 by Courtnie.